Lisa Koester presents the 2015-16 school calendar for approval. Lisa Koester presented the calendar option preferred by staff, with the first day of school being Aug. 25. The last scheduled day of school is May 27. The calendar has no built-in snow days and days missed would be tacked on to the end of the year. To view the calendar click here. The calendar was approved by the board, 4-1. Koester said there still could be some changes from the legislature on school start date, so this approved calendar is pending any action in Des Moines. Kevin Posekany presented a non-action item on the 2015-16 budget, with a worksheet with budget scenarios depending on what State Supplemental Aid gets set by the legislature. The total tax rate proposed to publish is $18.53 per $1,000 valuation, which is a 38-cent increase. The levy is set at the high rate based on zero percent State Supplemental Aid and any move up from zero by the legislature would result in the levy coming down. “That probably is going to change,” Posekany said of the $18.53 rate. A public hearing on the budget is scheduled for the April 6 board meeting. MHS teacher Tim Johnson and student Ellen Podhajsky requested an out-of-state trip to Kansas City for March 27-28. The group will see a symphony, a jazz museum and go to the World War I Memorial. The trip was approved by the board. All out-of-state school trips must receive board approval. Dr. Janelle Hawk requested permission for travel for the national speech qualifiers, June 14-19 in Dallas, Texas. MHS had Chandler Fisher and Megan Emerson qualify for the tournament. The group plans to do a lot of fundraising for the trip. This is the seventh consecutive year MHS has sent a national qualifier to the event. The trip was approved by the board. Dr. Susan Pecinovsky presented the Modified Supplemental Amount Application for Dropout Prevention for 2015-2016 for board approval. This year districts are asked to have these budgets board approved. The budget was approved by board. Dr. Marvin Wade said this scholarship fund created by the Folks will be used to give $1,000 scholarships to MHS students. “It’s greatly appreciated that they created this scholarship,” Wade said. This work includes some restroom remodeling, compliance projects and other remodeling at Anson and Woodbury elementary schools. The board approved the bid of $197,100 from Hay Construction for the Anson work and the bid of $728,000 from Brycon LLC for the Woodbury work. Both general contractors are based in Marshalltown. MCSD staff Deb Holsapple, Kirk Brooks and Meredith Goldman as well as Sister Chris Feagan and Pastor Gregg Davison talked about the work being done in this community partnership that was formed last fall. The goal is to be proactive in conflicts with students and work to get those involved in incidents back into the classroom and set them up for success after working with them. Brooks said an October incident at MHS affected the school and the community and it spawned this work. “We’re hoping that we never have to use it,” Brooks said. 705.1 – Purchasing – Approved by board, waived second reading. Lenihan Intermediate School students Xander Harwell and Megan Sills were honored for their art pieces, which received statewide recognition through the Art Educators of Iowa. Marshalltown High School student resource specialist Scott Johannes talked about being honored with the Golden Apple Award from WHO-TV. 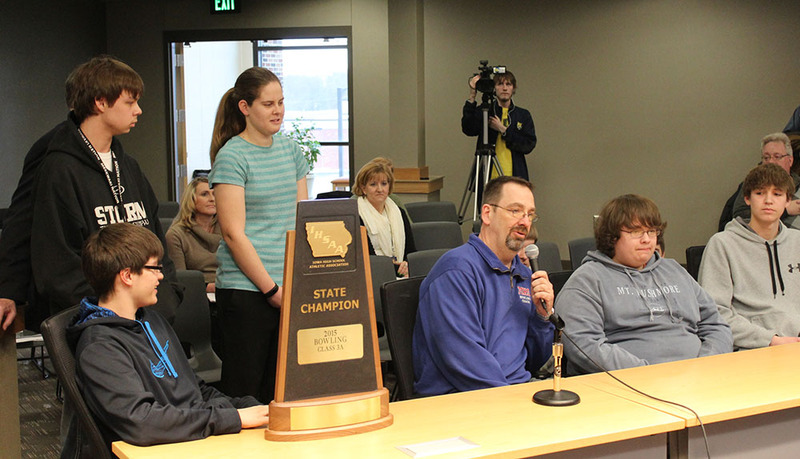 The Marshalltown High School bowling team won the Class 3A state team title on Feb. 25 and talked about their experience. The MHS boys bowling team was honored by the school board for its Class 3A state team title. Pictured talking is coach Roger Taylor Sr.
Anson Principal Ronnie Manis, presented along with staff members Jennifer Estabrook, Kim Hurley and Jennifer Janssen on strategies to help the school’s 360 students succeed. The four main areas of focus for Anson staff include SIOP implementation, math, language literacy framework and increasing parent involvement. Lisa Koester presented the process for selecting the next MHS principal. Dr. Marvin Wade and Koester plan to meet with MHS staff next week to share information on the process. Committees of staff, students, community members and administration will be formed and meet to determine criteria of what they want in the next principal. The district received 23 applicants from throughout the United States. Administration will sort through criteria and narrow the field to interview. Committees will determine questions to ask the candidates. Candidate interviews are planned to be scheduled for the week of March 23. The plan is come to the board on April 6 with a recommendation for the new hire. Dr. Wade said the district is starting to feel the crunch because State Supplemental Aid has not been set by legislature, and we are in the same boat with every other district in the state. There are several variables to take into consideration before building the budget. Kevin Posekany said in two weeks he will bring more budget information to the board. Rick Simpson and Dave Schulze presented remodeling bids for the Staff Development Annex at 315 Columbus Drive. This renovation will allow for the space to be used by the district and other school districts for training. The board approved the base bid and two alternates for $83,500 from Hay Construction of Marshalltown for the project. 902.2 – News Conferences and Interviews – Approve as amended and waive second reading. 903.3 – Building Visitors– Approved as amended and waive second reading. 903.7 – Parent-Teacher Organizations – Marked as reviewed. 904.2- Sales Promotion Prohibited – Suggested to be reworded and brought back. 904.4 – Money Raising Activities in Schools. – Marked as reviewed. 905.1-R1 – Application for Use and approval- Take a look at it and bring back. 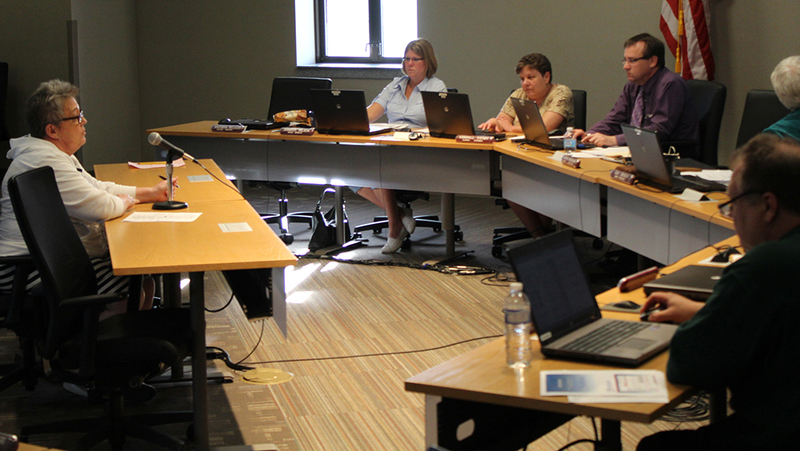 The next regular board meeting is at 5 p.m. March 16 in district offices.